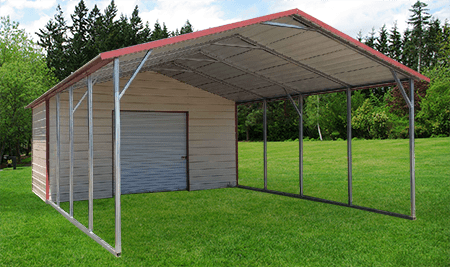 The A-Frame Utility Carport is an ideal way to store your boats, tractors, 4-wheelers, or other small vehicles. This option includes a 10-foot deep closed section at the rear for additional storage. Maximize your storage capabilities, and keep your vehicles running strong with our Utility Carport. If a vinyl door is added to either side, legs are required to be 7′ or higher.